Science, Industry, Trade and Information Technology Commission of Shenzhen Municipality issued the list of 2011 Shenzhen industrial enterprises top100 on March 21. 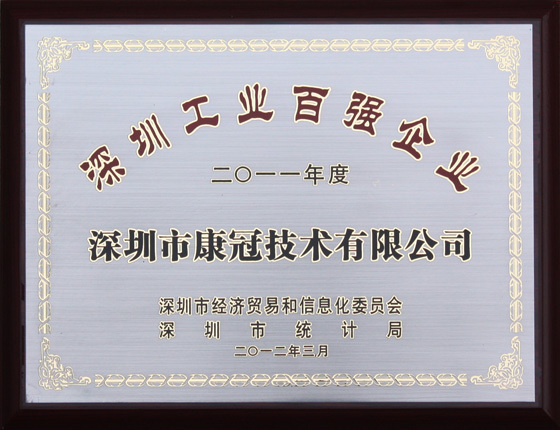 KTC is listed in 2011 Shenzhen Industrial Enterprise Top100, which is the third consecutive time to gain this title. According to the introduction of Science, Industry, Trade and Information Technology Commission of Shenzhen Municipality, the selection is principally based on the primary business revenue, total profit, industrial added value and other indices of last year, and rank on the basis of enterprise's total value of output. In 2011, KTC speeded up the pace of research and development and promoted production process. What's more, we provided diversified after-sales services and broadened the international market at the same time. The efforts listed above render a significant increase in company performance. Gaining this title reflects that the progress of KTC has gained recognition from the government. However, KTC will strengthen competitiveness of company continuingly and further, make a contribution to the development of Shenzhen's economy and society.